Mostly my work focuses on watching four Deblois Street Dories getting finished, one of which has hit the water. Compass Project's Dory launched successfully with a a bunch of excited students who helped build her. Compass is looking for another big project commission to use in their work with at-risk youth. 2015 Compass Project launch of the DSD. 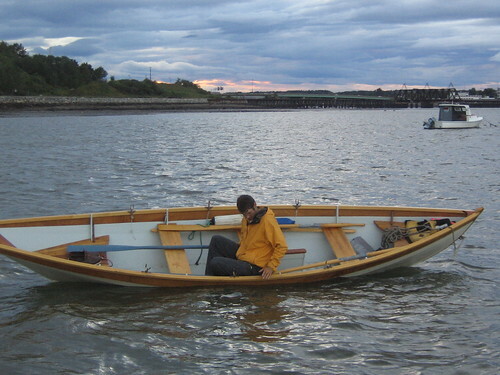 I am busily preparing the cutting of more Echo Bay Dory Skiff kits which will be built in Maine. This is the very latest version of the Skiff and any tweaks in the design demand a lot of attention to make sure all the details get done correctly. Those files are done and ready for more customers. It is hard to believe over 30 Echo Bay's have been built now! Also in the works are the files for cutting the first ever St Lawrence River Skiff kit for the Bain & Co. Annie model. I am back in the computer model after quarter scale modeling the hull. to be built at ABM in an August 10th workshop. Here is the information for my workshop in August. Spread the word! Contact me for more info. Clint Chase, an instructor at the WoodenBoat School, The Landing School, and The Compass Project, will teach how to build a St. Lawrence River Skiff. This boat is plywood and strip-composite constructed. One kit will be built in the class and raffled off to one student on Saturday. The boat will have some finish work to still be completed by the raffle winner. Participants must register by July 27 to make sure the class will run. For more information about the boat visit the webpage about the Skiffs. to The Compass Project in Portland, Me is building a DSD with a group of kids and they are doing a great job. The boat is built like dories have always been built, using the bottom to erect stem, frames, and transom, then turning over the boat upside down on a strongback. Everything is plumbed and braced then planking begins. Here the garboard has been installed and the sheer clamp is being fit. This is the only departure from traditional dory construction, the incorporating of the clamp helps tie together the frames into plumb and lock in the ends of the boat. It is a bit of a 3D puzzle! Now that Deer Isle Koster kits are shipping and and I have moved shop back to the home based-shop, I am enjoying some new found time to carry on with the newest, refined version of the Deblois Street Dory. The changes are mainly in the lining off of the hull and the fact that the hull is now modeled in 3D CAD allowing for precut parts to be made and a lot of tweaking to get the lines "eye sweet". The DSD was featured in the latest Maine Island Trail newsletter and there may be a follow up article this winter after I get started on this build. I am very pleased with how she is coming out! What do you think?